New official portrait of the Duchess of Cambridge was released. That portrait photo was taken by photographer Chris Jackson at the same time with 2017 Christmas photo of Cambridges family and the photo of Prince George released on his fourth birthday. 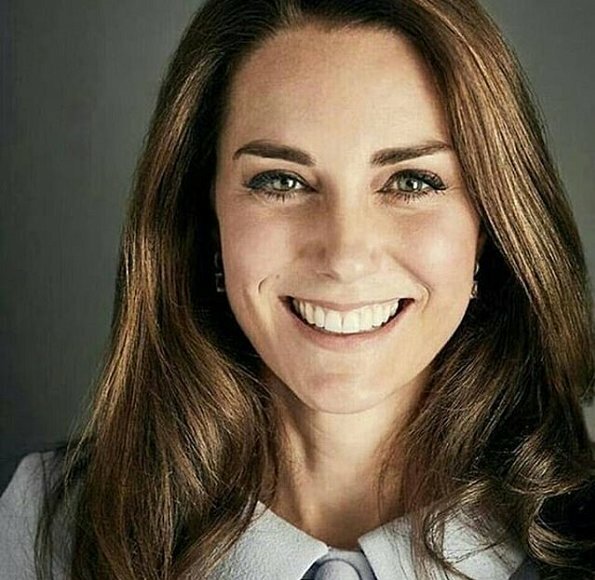 That new portrait was released in order to use on promotion pages of foundations and organizations which are under the patronage of the Duchess of Cambridge. Not true, she looks her age, beautiful and radiant. Chippy, what are you talking about?? No, it's not true, she looks nice and her age on this pic. But the lightning is very bad and the viewing angle is unfavorable - like a cheap passport photo. I would never have published it. She has had better photographers in the past. What a very unfriendly thing to say! She looks beautiful! She does not! And bwt 45 is not old. What does 45 look like? She looks young and fresh, lovely picture!!! That's a harsh comment about what age she looks. And not true at all. Too bad lord snowdon died, he would have taken a much flattering picture. I really like thos photo. I am a few years older than she but I don't think she looks over 35. I like these lighter pieces in her hair. Regardless, I think it is a genuiune smaile and that makes anyone look great. I've always thought the color of her eyes is beautiful. Her eyes are beautiful. The colour varies from green to a silvery grey. Very nice photo. Her personality shines through. Très jolie photo que celle-là. La duchesse Kate y apparaît rieuse et lumineuse. Heureuse quoi! 2018 will bring inspiration and new thoughts. Charléne ? Quelle Charléne ? Il y a 10 ans ou aujourd'hui ? I agree with Sonnenkringel. I like her naturalness. Queen Rania, Letzia and princess charlene are famous for visiting a Beauty doc. I like Maxima too. Suzy, Madeleine looks average, when she's not made up. And as for Charlene - compare the photos of nowadays to former pictures. Her so-called beauty is plastic surgerey. She looks young to me! Wow. This seems extremely judgmental. So you are saying that Catherine doesn't have real beauty coming from within her soul (!) compared to some on your list of favourites who are heavily botoxed? Seriously? And yes, I think your comments are hurtful. I think Catherine is beautiful, but this photo does not give the taker any great merit. Not any good lighting or focusing really. I would myself have deleted this one from portrait pictures. I think that Catherine never looked better than these days in her third pregnancy. She should have engaged a really good photographer who had been able to capture her glow and her special vibration at the moment. This photo does not do her credit. It is technically spoken not a good photo. The position, the focus, the cutout, the light, the resolution. All could have been better. I wonder who took it! No. What I was trying to say is that everyone finds different people beautiful and that's okay. Everybody has different taste. Real beauty comes from inside so doesn't matter who finds Catherine beautiful and who doesn't because what really matters is inside. Maybe because of my english it doesn't sound the way I want it to but I hope you can understand it better now. Agree. She's such an attractive woman, but her choice of portrait artists is often not the very best. I remember this awful official portrait painted by Paul Emsley.